The original is one of the most iconic pieces that heavy metal has to offer and is a timeless classic, so for reference, here’s Iron Maiden! First up we have a legend covering a legend and Motörhead most definitely qualifies for legend status and let’s be honest, Lemmy giving good old Bruce a run for his money is just something to behold! One of the beautiful things about a good song is that it will work in almost any setting. The J-Metal version by Omnyouza might take a few people by surprise, especially in the vocal department, but one thing is for sure it is different! As we just had Lemmylegend on call earlier, how about one of Teutonic thrash’s most prominent names – Sodom. Now while the quality of this live recording is not the best, having Sodom with Peavey Wagner of Rage doing a pretty raw rendition is a rare sight indeed. What starts out like a regular cover of the song soon changes big time, when the vocals come in during Vital Remains’ death metal take on the classic! Finnish Sentenced had gone through quite a bit of a transformation throughout their career, starting out as pretty much pure death metal and then morphing into one of the leading gothic metal bands. This version is obviously from their earlier years with pretty nasty vocals and faster than the original! Moving from death into black metal, Swedish Lord of Belial add the screech to the vocals and a lot of black metal to the music itself! Returning to the more melodic waters, US rock band The Protomen started out composing concept albums about the video game series “Mega Man”, but also decided to give one of metal’s greatest a nod. There are people that consider Iron Maiden one of the most progressive bands of metal, even though they clearly do not fall into the classic progressive metal category. That does, however, not stop American progsters Coheed and Cambria to put their unique touch on the classic. As mentioned earlier, a good song will work in any style, so why not fully acoustic? Exactly what Of Good and Evil thought as well. And finally one of the most original Iron Maiden covers ever, courtesy of Finnish barnburners Steve’n’Seagulls. Contrabass? Banjo? Balalaika? Sold! Let us know in the comments which one is your favourite or if you have any others you prefer. Also feel free to give us suggestions which songs we should try to hunt down for our next edition of “TMOx10: Covered up”! 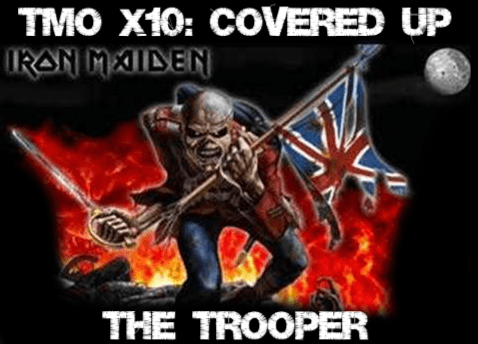 This entry was posted in Specials, TMO x10 and tagged Coheed and Cambria, Covered Up, featured, iron maiden, Lord Belial, Motorhead, Of Good and Evil, Omnyouza, Sentenced, Sodom, steve'n'seagulls, The Protomen, The Trooper, TMOx10, Vital Remains.